Originally from Southern California, David has traveled all over the USA and beyond. He studied theatre arts, psychology, film, video, and photography. He moved to New York City and became involved in the theatre as a director, playwright, actor, and stage manager, even winning several awards for poetry. In 2001, he moved to Seattle and found his favorite day job as a barista. For a year in 2006, David moved to Sao Paulo, Brazil, to teach English. 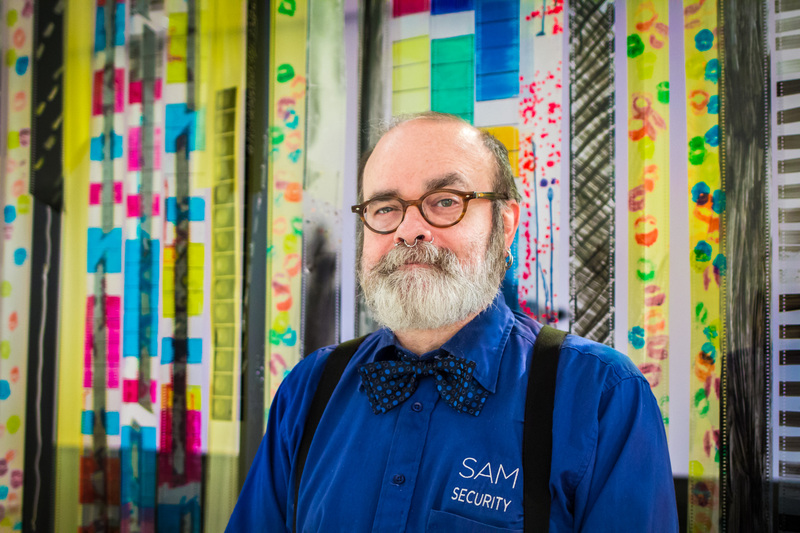 Upon returning to Seattle he joined the SAM family since being around art has always been inspirational to him. He started writing for a small British movie digest in 2015 and traveled to take a marionette carving workshop in Prague, Czech Republic. With his experiences in the arts and travel, David enjoys the inspiration he gathers at SAM and continues to dabble in experimental film and photography, writing a novel, and writing poetry. SAM: Pure Amusements: Wealth, Leisure, and Culture in Late Imperial China is a new addition to the downtown location’s Asian art display. What is your favorite piece in this section? Nevarrez: The Scholar Rocks, as I had not known of them. Not only are they fascinating, but I learned something new. Film is Dead . . . by Jennifer West—draped rolls of large format film stock, which has been painted on (as was done by such experimental filmmakers as Stan Brakhage), or has abstract images (some resembling digitization) hung up as a curtain (like the old “hippie bead” curtains popular in the ’60s), reaching the floor, and rolling up to 3 large screen TVs showing rolling film images of the abstractions. Is film dead? More and more, movies are shot with digital video because it’s easier to manipulate. While film had twice the light reception of analog video, digital has more than film, though for DV to look cinematic it must be manipulated in post-production. This does not mean some filmmakers don’t still use film; I have seen an announcement at the end of several big budget films that they were shot on actual film stock. Even so, with DVallowing filmmaking to be more accessible, has not the idea of “film,” that is cinema, simply become un-reliant on celluloid and more egalitarian? As a cineaste, I first think of filmmakers when asked such a question. Over the last couple years have immersed myself in three directors of note: Andrzej Zulawski (who sadly died last February), Abbas Kiarostami (who sadly died last June), and Aleksandr Sokurov. All there are very poetic in their respective styles. Zulawski (best known in the States for Possession from 1981 starring Isabelle Adjani and Sam Neill) features intense emotions between characters, especially lovers, in an almost musical style. Kiarostami (best known here for Taste of Cherry from 1997) has more of a cinema verity style, wherein his films seem unscripted and very natural. Sokurov (best known for Russian Ark (2002)) looks at different aspects of power, from the personal to the epic. Give yourself time to wander about at first, so as to note some area that especially interests you, then return to the area for a more in-depth exploration. After a 9 year hiatus on my novel, I have gotten somewhat back to work on it, partly helped by expanding out to include it within a long saga, concurrently working on other parts. I also work on some films and videos.